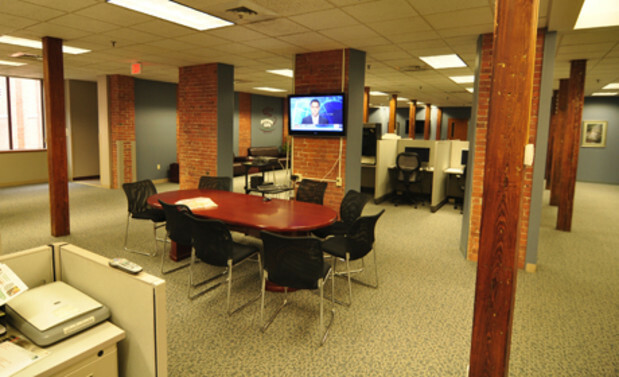 When you talk about the subject of open journalism and open newsrooms, one project which often springs to mind is the Newsroom Cafe at the Register Citizen newspaper office in Torrington, Connecticut. The office opened in December 2010, as both a newsroom and public cafe, divided only by a meeting table where journalists and citizens could come together to discuss story ideas. The general idea of physically returning the newspaper office to its local community, making the newsroom the hub of the local area, is something the Journal Register Company is keen to replicate at other titles, such as at the New Haven Register. "It's almost like back to the future," group editor of Journal Register Company's newspapers in Connecticut Matt DeRienzo told me. "That's where newspaper offices used to be." "We want to have this approach at every newspaper that we have. For example in New Haven in Connecticut, which is a bigger community, that's where Yale University is and so forth, we are selling our building, which is out in an industrial area off a highway. You don't walk to it, it's not downtown. So we're selling that and we're going to open something right in the heart of downtown." And the Register Citizen is a solid example of taking this a step further, to actively encouraging its readers to visit the offices, use its computers, take part in workshops, or even buy some artwork. And it is not just in the office where titles within the group are pushing community engagement, with parent company Digital First Media recently launching a series of new community news projects, including "mobile community media labs". The first of four of these mobile media labs launched last week with the TCRover van taking to the road with St Paul Pioneer Press. It is described as "a modified Ford Transit Connect" featuring "WiFi, a generator, awning, chairs and a pull-down projection screen". Back at Torrington's Register Citizen DeRienzo outlines the different stages of community engagement taken by the newspaper during the last couple of years, and what the results have been for reader relations, trust, credibility and business. The arrival of John Paton as chief executive of owner Digital First Media in 2010 saw a "pushed focus" on not just the journalism being produced by titles within the group, but also the "empowerment of the audience", DeRienzo said. The first steps taken included features such as ensuring a "good corrections policy" and the addition of a "simple fact check box at the bottom of every story". "If it's about relationships, you need to have trust and you need to have transparency," DeRienzo added. In Torrington there was further opportunity to take this a step further. The Citizen Register was looking to relocate and the idea came about for an office space which lacked one key thing - a wall between the journalists and their readers. While the journalists had their newsroom, there was also room built in for a coffee shop with free WiFi, which DeRienzo said is "kind of at a premium in Torrington". The idea was to ensure that the public space enabled those who used it "to engage on their terms and allowed a continuum of engagement". And then this was built on with the addition of features that would add value to the experience for the community, "our strengths that would be valuable to people, that would bring them there, other than just to talk to us". This included the opening up of 134 years of microfilm archives to the public and investment in new microfilm machines. The newsroom also provided computers accessible to all, "so you could come in or study, or work on a work project, or meet with friends – we even had people who used our coffee shop for book clubs and knitting circles". "So you can come and engage with us very passively by just using our space, getting to know us kind of on a social basis." This may then develop into an editorial interest on the part of some members of the community, who could then "venture over" to the central meeting space and sit in on story planning meetings, which were also opened up to the online audience with livestreams and web chats. And it did not stop there. The Citizen Register newsroom also includes a built in classroom "where we offer free community workshops on things like the Freedom of Information law and technology topics, or storytelling or journalism topics", DeRienzo added. It can also be used free of charge by organisations to hold meetings. The newsroom is also on hand to support members of the community keen to pursue their passion for writing on a certain issue. "Say you have an interest in women's field hockey and you have an obsession about it and you want to write a blog that is the world's biggest authority on women's field hockey in north west Connecticut – you can use our equipment, we'll help you edit a video that you take, and we will link to you work. "We don't need to own it, we don't need to control it, but we'll help enable you tell those stories and in the process we will open our readers to a new source of information. So in addition to our original reporting we want to encourage, support, aggregate and curate the work that our citizens can do themselves. So that has opened us up to providing more information than ever, I guess, to our readers." Once you have opened the door to the community, how do you encourage them to come through it? News about the cafe newsroom spread partly by word-of-mouth, but it is also the added value features on offer which help draw people in, DeRienzo said, from a "little-used book sale" in the corner of the cafe to its 'artist of the month' programme. There have also been great examples of the newsroom offering public services in times of crisis and need within its community. After the Japanese earthquake the newsroom advertised itself "as a resource for people who were trying to find their families". "So we said come in and you can watch cable news on our big screen TVs and use our computers and a reporter can help you navigate the Google missing person search and so forth." During a series of hot days in recent summers the office "opened as a cooling centre for elderly who did not have air conditioning", and during heavy snowfall one winter the newsroom connected volunteer readers with snow blowers to other members of the community who needed to be shovelled out. "It's not your typical newspaper work," DeRienzo admitted, "but it's the overall mission". Editors and journalists may like the idea of opening up their newsroom, but how realistic is it to expect a busy newsroom to manage these additional community activities? "The scepticism in the industry naturally would be 'well I have x number of stories to write today and we have smaller staff than we used to have, you want me to organise an artist of the month programme - what the hell! '," DeRienzo acknowledged. Which is why a "valuable investment" at the Citizen Register was to have a full-time community engagement editor tasked with managing the schedules of activities. And at New Haven there are two full-time people in the same position. Of course along the way there have been lessons for the newsroom and for the Journal Register Company. On an average day the office is visited by around "a couple of dozen" people, DeRienzo said. But there is not "a huge amount of people attending story meetings", which he said "was an interesting lesson for us". "We thought 'oh yeah if we open our story meetings everybody will be obsessed with this and come in' and they weren't. But that's ok and I will never go back to doing them behind closed doors again because I think the transparency thing, even if no one is there, is important." But overall the successes for community relations with the paper, and its digital development, have been significant. "This relationship with the audience and the community is about our very existence, I think, and it immediately has paid off in terms of faith in the brand and stature of the brand in the community, which pays off in the digital audience growth that it spurs. And local businesses' faith in our knowledge of the digital sphere has paid off tremendously in growth in digital advertising. "So our company talks a lot about a cross-over point, and a cross-over point being when digital ad revenue replaces print losses, and in America last year newspapers generated only one dollar of digital advertising growth for every 10 dollars in print losses. Our company was much closer to being 10 per 10. It wasn't quite there, but much closer. And in Torrington specifically when we opened the newsroom cafe, our digital advertising as a percentage of our total ad revenue was 4 per cent, and now it's closer to 30 per cent." His key lesson and piece of advice for other organisations considering a similar model? "Don't expect it to happen on your terms. "It's going to happen and it's really going to take off and be successful when it's on the terms of your audience. So you're going to really hit a home run and connect with people when you touch on something they really care about and they're interested in. "You're going to be frustratingly unsuccessful when you try to bend them to participate in something that is on your agenda but not on theirs. And that's a trial and error thing." Hear more on the topic of open journalism with this Journalism.co.uk podcast featuring DeRienzo as well as the Guardian's national editor Dan Roberts and presenter of World Have Your Say on the BBC World Service Ros Atkins.